AMESVILLE—Natalie Tevis will tell you she isn’t really one for the spotlight. In fact, she says one of her best skills is the ability to put the right people in the right places at the right time. 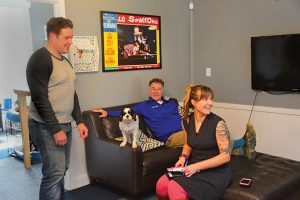 But something as simple as that can be key for small business growth, and without her, Airclaws, a heating and cooling business in Southeast Ohio, wouldn’t be where it is today. Natalie and Will’s home is filled with color and is a private showcase for art created by family members or special pieces picked up while traveling. Tevis’ husband and business partner, Will, started out in construction, but got into HVAC when the company he was working for made the switch. In 1994, he split off and started Airclaws. For the first 15 years, they were strictly commercial before entering the residential market. Developing the business meant recruiting the family. Will’s eldest son, Ryan, works there as well as his daughter, Adrienne, and her husband Ray. (Middle child, Caleb, lives with his family in North Carolina.) Tevis said working with Will is great, but downtime can be tricky. Growing up in Meigs County, Tevis didn’t have her goals set on running a small company. Her father, who started Quality Window Systems Inc. in Pomeroy, Ohio, always had his own business, so she saw the struggles of running it and raising a family firsthand. Instead, she was called to help others navigate their lives. She spent most of her 20s-30s ministering and living simply, two qualities that helped turn her into the businesswoman she is today. When she and Will reached a point where the small company needed to grow, Tevis took the opportunity to turn her counseling skills into customer service. 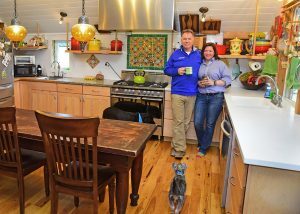 Ryan, left, Will and Adrienne Tevis and Barkley the dog. The entire family plays a part at the business. The attention to customer satisfaction is reflected in the support of the surrounding community. Three years in a row, local newspaper the Athens NEWS named Airclaws best local HVAC business, as well as several other titles throughout the years, including first runner up for best local ad campaign, and first runner up for Tevis as best local entrepreneur and business owner. In 2017, local environmental and social justice nonprofit Rural Action awarded Airclaws’ efforts with its Sustainable Business Award, which caught Tevis pleasantly by surprise. Tevis likes to spend time in that environment and enjoys running half marathons and other races. She also loves listening to audiobooks and podcasts, especially “How I Built This” with Guy Raz, a podcast about entrepreneurs and idealists, and their creation processes. As the new driving force behind the business, Tevis began going to meetings, classes and trainings, and partnered with an organization that helps HVAC businesses grow. With Tevis’ efforts, Airclaws went from averaging seven employees to 22 full time positions. 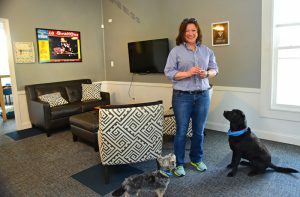 Natalie Tevis and two family dogs are seen in the Amesville office of Airclaws, her family’s HVAC business. Airclaws is working to finance a dog park. At one of the Bryant dealer meetings, Tevis noticed something interesting about the Medal of Excellence winners. All the male dealers received red jackets while female dealers received something else, like jewelry or a shawl. Tevis sought to make a change and have the jackets made available to everyone, including herself. She was the first female Bryant dealer to receive a red jacket when Airclaws won its very own Bryant Medal of Excellence. Tevis wants to make sure Airclaws earns all those awards, and the public’s trust in their product and values. Giving back to the community and her customers is a priority. Airclaws sponsors the local elementary school’s spring carnival, donating set-up and tear-down labor, prizes for the auction, and more. The company also helped pay to have the park’s basketball court repaved and are working now to finance a dog park. And as for customers? Each month, Tevis sends out boxes of goodies from a local bakery to new customers, complete with a thank-you card signed by everyone who worked the job.